This crazy quilt features green and red velvet sashing that forms two large diamonds spanning the top. Sashing is embroidered with initials and a date. Quilt top's irregular pieces are outlined in featherstitch embroidery and decorated with embroidered flowers, plants, birds, butterflies, and appliquéd objects. Wide apple green velvet border is embroidered with flowers in three corners and wheat stalks in the fourth. 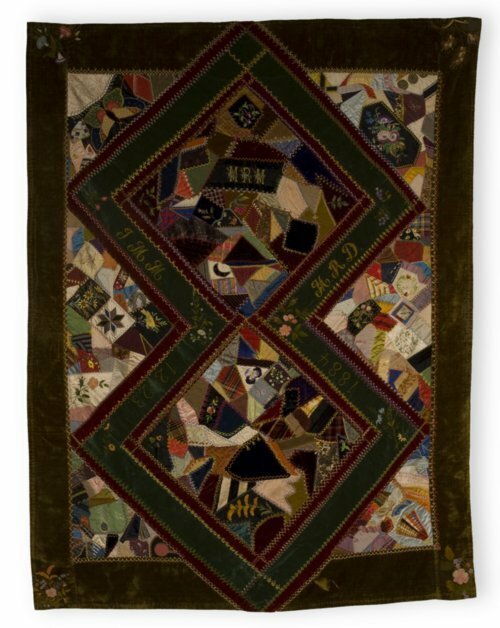 This elaborate quilt was made by Clara Strieby Hughes of Council Grove, Kansas, as a wedding gift for her niece Mary Dillon upon her marriage to James Monroe Miller on Dec. 23, 1884. Hughes was a businesswoman with a share in the M.C. Armstrong & Co. store in Council Grove. The silks she used in this quilt may have been store samples.